NHL Bob Hall Mike Leggo Shane Heyer USA Development Program Jonathan Morrison NCHC Director Of Officials Don Adam Pacific Referee In Chief Steve Stevens Supervisor of Officiating CSHL (Jr.B),CSCHL-a USA Hockey Division I College Club. EXCITING CAMP NEWS LEVEL 4 We are pleased to announce that USA Hockey will now be holding a level 4 Certification session during the California Referee School. You now have the advantage of both in one location. This is a step in a positive direction for better Officiating. Camp at Toyota Sport Center, in El Segundo California, the practice facilities of the LA Kings and LA Lakers. Close to South Bay Beaches and others Los Angeles area attractions. The school is open for referees level 1 and up. The Sport Of Hockey Is Exploding! As a result, the demand for competent officiating is greater than ever. 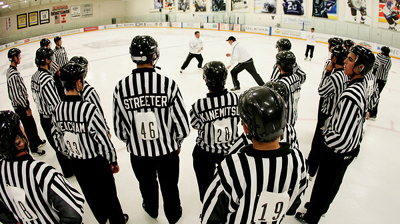 California Referee School introducing and developing ice hockey officials of all ages. 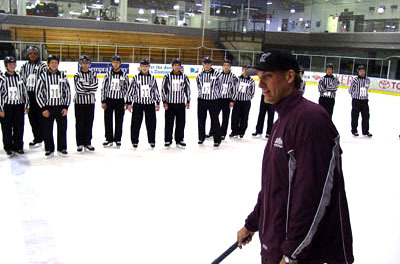 Meet some of the top hockey officials in the country and learn valuable lessons that will help take your officiating game to the next level! The School is design to satisfy all officials from beginners to advance, no matter what level you are you will learn! 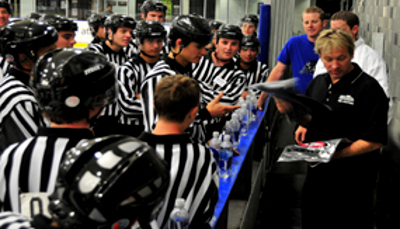 Learn what it takes to become a hockey referee at the California Referee School at Toyota Sports Center. Rob Shick, Mike Leggo, Shane Heyer and Don Adam our instructors, discuss career highlights and insights into this fascinating training process while Andrew Santino is put to the test on the ice with the other trainees. Classroom and video instruction will include a review of USA Hockey, NHL, NCAA rules as well as studying the psychology of the game. There will also be question and answer sessions for you to interact with the instructors. 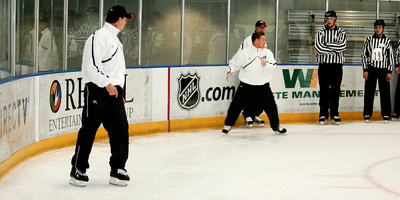 On-ice instruction will include: positioning, signals, skating drills, conducting face-offs, game situation participation.